Vale’s Coleman nickel mine is trialling two battery-powered load-haul-dumps (LHDs) in its lowest ore body. Artisan Vehicle Systems’ A4 loader and Atlas Copco’s ST7 Battery will operate for six months in Coleman’s 170 ore body, which begins at 5,600 feet below surface and goes down to below 6,000 feet. The trial began earlier this month. The A4 loader launched in March, and has a battery life of four hours before it needs to be charged, according to Mike Mayhew, Artisan’s director for mining. The charge time is an hour. The ST7 Battery lasts for four hours and the company boasts it can be charged during the lunch-hour to extend its operating time to a full shift. 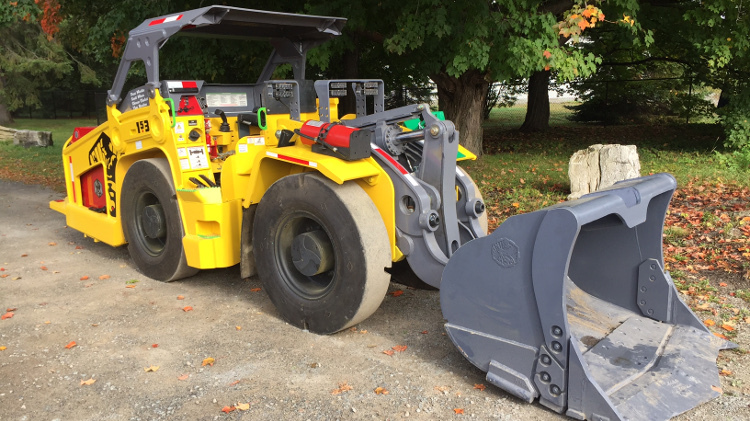 Alistair Ross, Vale’s director of mining, Ontario operations, said the company sees many benefits in battery equipment, including removing diesel fumes from the workplace and reducing ventilation needs and the associated costs. He also pointed out that the exhaust from regular diesel-powered equipment can disturb dust and create breathing issues for workers. The trial’s aim is to determine whether the battery technology works for the company. “What we’re looking to learn is, has the technology advanced sufficiently to be at a usable stage for us,” he said. For example, the charging method for both LHDs is a battery switch-out rather than on-board charging, and Vale wants to determine how easy it is for workers to make the switch themselves. The mine will have a dedicated battery bay station with a spare battery available for miners to swap out, and the battery charger. Ross said both LHDs are “on the small end,” which was necessary because only small equipment is able to fit in the 170. The A4 has a four-tonne bucket, and the ST7 Battery’s bucket is 6.8 tonnes. Battery-powered electric vehicles have gained popularity as mines go deeper in search of higher-grade ore and larger reserves. Mayhew said there is now a “huge market” for loaders and trucks with battery technology. Kirkland Lake Gold implemented RDH Mining Equipment’s battery-powered electric vehicles at the Macassa and South Mine Complex in 2012, and currently about one third of the site’s equipment fleet is electric. Artisan’s A4 is now in production at Kirkland Lake’s Macassa and Taylor mines and Hecla’s Lucky Friday. Mining companies have also begun planning their sites around battery equipment. Glencore designed its Onaping Depth site around an all-electric mining vehicle fleet to manage ventilation challenges, and in September 2016 Goldcorp announced it would design its Borden Lake project as an all-electric mine, in partnership with Sandvik and MacLean Engineering. I would like to receive your updated technical information. All of our update technical information can be found on our website.